The Canadian Blood Service has a slogan, “It’s In You To Give” and, had it not already been taken, I think that would be an excellent slogan for every Christ follower. It is in you to give because our God has generously given everyone a unique path, a unique gift, and a unique calling! Sometimes we don’t give this enough consideration. Sometimes we don’t ask — “what is my path, my gift, my calling?” (even if that calling is just about today’s calling). Sometimes we don’t think what we can do is usable anywhere else, but I assure you…it is. It is because God has given everyone SOMETHING to use to do the things He wants done. Isn’t this beautiful to look at? I haven’t canned a single thing in my whole life, but I stood back and looked at this display and appreciated the work behind all of this; the love behind all of this. So you have the skills to can fruits and vegetables; what good is that gift? I submit this photo for your consideration. How beautiful are the hands that made these? That’s how God works. Some gifts sound beautiful, some gifts look beautiful, some use math, some taste amazing, some use a hammer, and some involve a pen. Some gifts teach us, some touch us, some change our surroundings or our mind. Some gifts call us to attention, some heal, some encourage, some lift us up before God. Some gifts renew our faith, some preach the Gospel in public, some have a way of reaching the ignored and unseen. Using our gifts is a thing we do, because they were given to us by our heavenly Father to be used. What is your gift? Colleen L. and Chelsey H. are leading a small group of mostly young families. Most of the adults in this group are just trying to catch their breath, maintain their sanity and survive the wildly unpredictable stage of life they are in. Besides the adults, there are lot of little people who require supervision! The adults can’t easily leave the house and meet up with their small group. Meeting up requires a whole care strategy and a whole care strategy can be blown to bits by a cold, a tantrum, a call from the teacher, a coup d'é·tat…you get the idea. What does it look like to “serve” during these hectic years? “The things we do” look differently, but no one, in any stage of life, needs to be sidelined! There is always some way to be useful! Talking to Colleen about this, she said, “We are a negative asset if we show up anywhere to help with all the kids!” so containment is key! Recently the small group got together in a house (with doors and locks and toys and …) where the kids could run and play and the adults could be productive. They baked a whole stack of Shepherd’s Pie that evening to give to the Lunch Program! 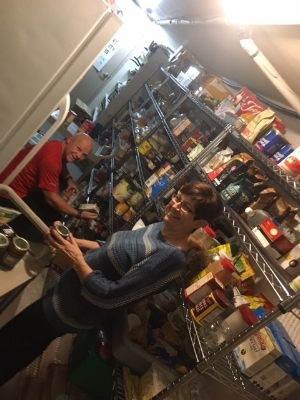 While all this cooking was going on, the guys sharpened knives for the Lunch program (and thanks also to Steve C., whatever they couldn’t get done that night was completed through West Kelowna Home Hardware donating their services). There were kids underfoot, goldfish everywhere and shifts on/off to snuggle babies ‘cuz this is what you do when you want to “do things” for others out of your love for Jesus. Sometimes it takes some creativity! What are you feeling prompted to do? Want to get involved in the lunch program? We partner with Westbank United Church to provide lunches daily to those in challenging situations in our city. Use this contact form to link up!